Under a scorching midday sun, a group of men survey a row of thatched huts built on a barren stretch of land. "We could place the classroom there," says Rajamani who is perspiring heavily. 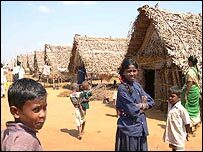 Palabakam is a very basic, almost primitive village that has just been built in the southern Indian state of Tamil Nadu, just a few hours drive north of the capital Madras. But its inhabitants are not put off by its remote location or the fact that most of the houses provide only a little protection from the harsh climate. The 400 people who live here all have one thing in common - they were recently freed from a life of virtual slavery. 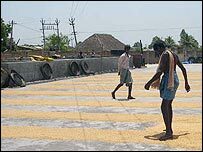 "We were bonded labourers," explains Murugesan, "working in rice mills not far from here." 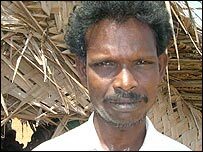 Murugesan is one of 100 people who were released from several rice mills located in Red Hills, just 17km north of Madras. All of them are Irulas - an indigenous tribe local to the area but displaced from their land over the years. "Thousands of Irula tribal families are kept as bonded labour in hundreds of rice mills in Red Hills," says Sidhamma, a women's activist who helped free the bonded labourers. "They are mostly illiterate and completely unaware of their rights," she says. 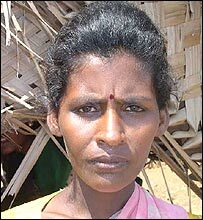 Lakshmi, 32, recalls her life in the rice mill as one that she would like to rapidly forget. "We slept in the open - never mind whether the sun was beating down or it was pouring with rain. "There was no drinking water, no toilets, no where to bathe. If I wanted to take a bath, I had to do it in the open, in front of all the men." She has three children, who were also forced to work - the younger ones cleaned the mill while the older ones helped dry the paddy. "Many children had accidents because they live in close proximity to mill equipment," says Rajamani. There was also no question of going to school. It comes as no surprise then that one of the first things that the freed labourers did was build a temporary classroom for the children. For some, the consequences of working in those conditions were horrific. D Sekhar, 28, was working in a rice mill when his wife died after giving birth to their third child. "She was forced to work right up to her delivery and soon after," he says. "I was not even able to conduct a proper funeral for her." Women's activist Sidhamma says many of the women were vulnerable to sexual exploitation. Rajamani was among several men who ran away from the rice mill last December and approached the activists to ask them for their help. "It was a very brave thing to do given that they could be brutally beaten up by the owners if they were caught," says Sidhamma. Despite approaching the local authorities, they received little help. "They insisted that there was no bonded labour in the rice mills. "This despite the fact that the workers would be paid 15 rupees ($0.3) a day for 19 hours of hard labour," says Sidhamma. Under Indian law, employees must be paid a minimum wage of 86 rupees ($2) for eight hours of work. "Besides this, many of the workers were forced into high debt by the owners, lived a life of virtual imprisonment and could be traded by their employers," says Krishnan, himself a former bonded labourer who now works to rehabilitate them. It was only after mass demonstrations by the workers and the intervention of India's National Women's Commission - a federal government body - that they were rescued. "We managed to get wide publicity and the matter was even raised in the Indian parliament," says Sidhamma. Several months later, the rescued labourers are enjoying the benefits of freedom, however basic. "It is a wonderful feeling," says Murugesan. Most of them now work as labourers in nearby farms. "We are paid 50 rupees ($1.15) for half a day's work, the women get 30 rupees (70 cents)," he says. Each family was also given 40,000 rupees ($922) by the government. Some of them have used the money to build brick houses. But not everybody is happy. At the Bagalaxmi rice mill in Red Hills, I am greeted with open suspicion as I ask to be shown around. A few people are at work, but the machines are silent. "We used to have 50 people working here," says owner G Balasubramaniam. "Now there are only 10." He insists that he takes good care of his employees and that the bad publicity has only resulted in his financial doom. "There is no help from the government. They are only interested in helping the workers," he says bitterly. Back at Palabakam, a class is under way in the village school. 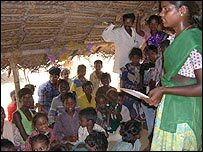 Gautami, a young woman from a nearby village, now teaches some 70 children. "This is a community school, run by us. There is no government role here," she says as she assists a young girl with her sums. "I teach them everything - how to read and write Tamil, how to count - all that I know." "It is very important for our community to be literate. Because we were uneducated, we were exploited," says Rajamani. "I don't know how to read and write. But I want a better life for my children."